Five years ago our first visit to Austria was a total accident. As two young backpackers, we had rented a car in Munich before heading South to Bavarian Alps. It wasn’t until we were sitting in a restaurant that night that Cameron asked, “Are we in Austria?”. Sure enough, we were surrounded by Austrian flags and that little dot on our GPS confirmed we had arrived. The only problem, on a tight budget we had to sleep in the rental car. This time around we arrived in Innsbruck with plans. With our snowboards in tow, we made plans to properly explore Innsbruck by sight and slopes. 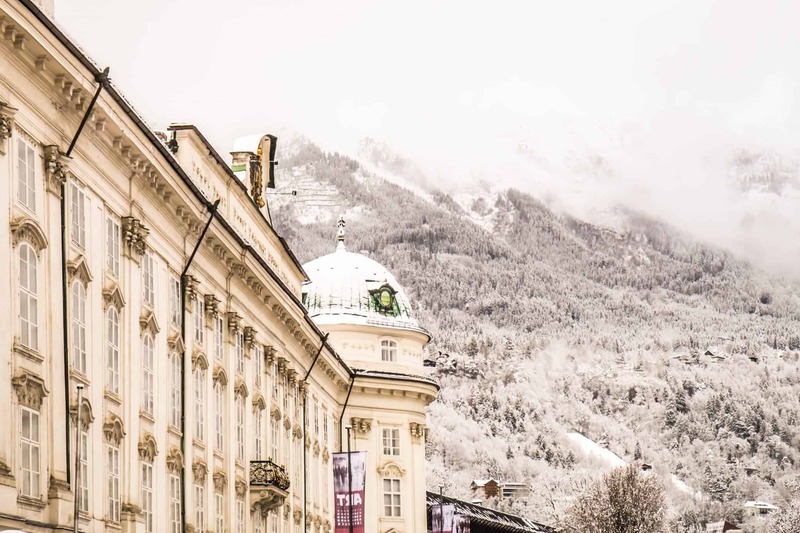 It’s the only city where you can ski, explore a grand palace, window shop, and savor a strudel all in one day. In many ways, it’s everything we love about Austria. A modern and historical city that within minutes places you in the heart of the Alps with cowbells ringing and fresh Alpine air. 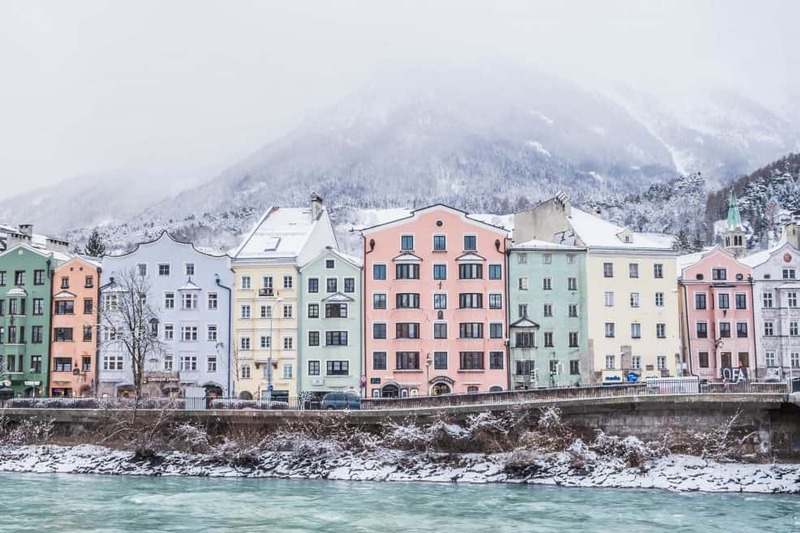 Wondering what to do in Innsbruck? If you enjoy grand European churches then a visit to The Hofkirche can’t be missed. The Gothic church was built in the mid-1500’s and is located in the center of Innsbruck. As impressive as it is from the outside you have to go inside to marvel. The interior of the Hofkirche is grand, to say the least. The main attraction is the Cenotaph of Emperor Maximilian I, which is surrounded by 28 statues depicting his various ancestors and heroes who include Leopold III and King Arthur. 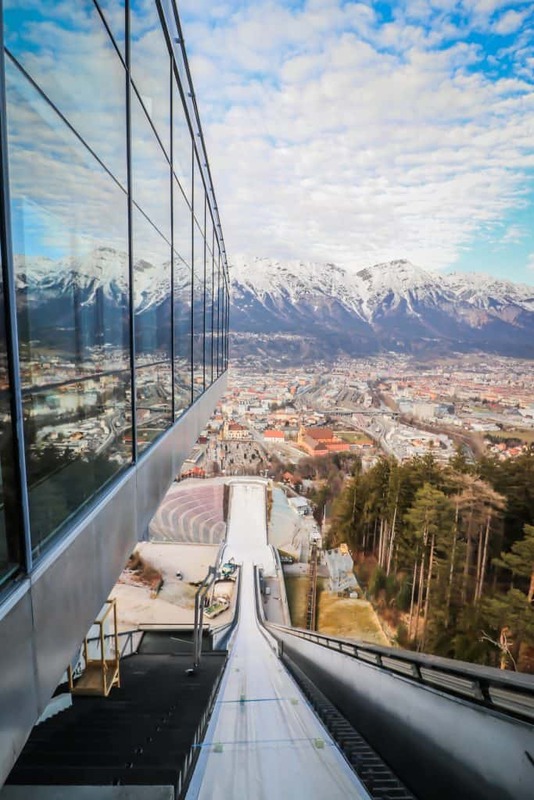 The Bergisel Ski Jump is a world-class ski jump hill that can be seen from just about anywhere in Innsbruck. It’s an unmistakable icon of the city and was redesigned by the famed Iraqi-British architect Zaha Hadid. The venue has been used in two Olympic games (1964 and 1976)! Each year, the Bergisel Stadium plays host to the annual Four Hills Tournament in January and also to a Summer Grand Prix Jumping Event. Although, visitors can get the views from the beautiful ski jump every day. The main tower stands 47 meters tall and provides amazing views over all of Innsbruck and the Alps. After taking the gondola to the top of the ski jump, you can look down and feel what it’s like to be a daring ski jumper. Or you can enjoy the peaks of Patscherkofel, Nordkette, Hohe Munde and Serles from the restaurant and cafe on a clear day! 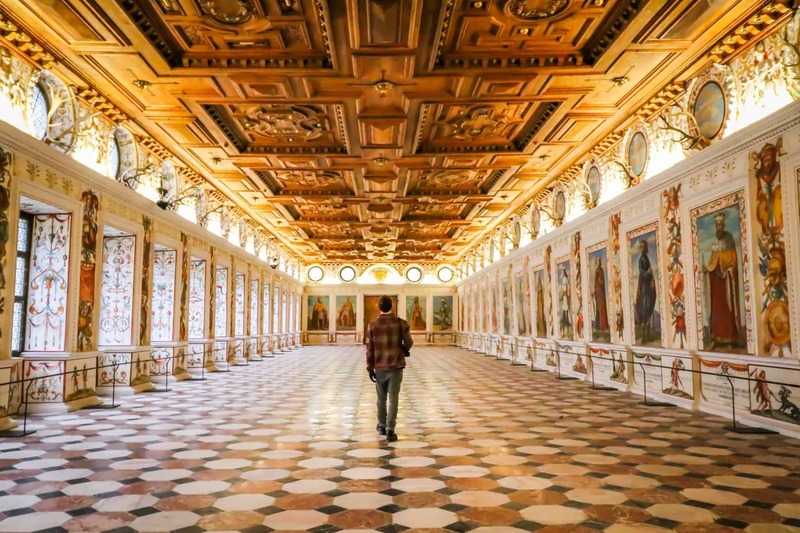 Unfortunately, the Imperial Palace was closed for renovations when we were in the city, but it is consistently ranked as one of the best things to do in Innsbruck! Completed in the year 1500 under Emperor Maximilian I, it is now the third most important historic building in Austria. You can wander the Hofburg freely, or take a guided tour! Less than two hours after arriving in Innsbruck we knew we had to make our way to the lovely renaissance castle perched above Innsbruck. Built in the 16th century and connected with Archduke Ferdinand II, Ambras Castle is one of the most popular tourist attractions in the region of Tyrol. Depending on how into Renaissance history you are one could easily spend a few hours rambling about the castle. Although we aren’t huge on museums, Ambras Castle is truly unique. The highlight is the Spanish Hall, a lavish and divine hall fixed with 27 full-figure portraits of Tirolean Habsburg rulers. They still hold formal events in the Spanish Hall to this day such as concerts. Another highlight is the Chamber of Art and Curiosities, there you will find rare objects and artifacts from the 16th century giving a glimpse of Renaissance life. If you have just arrived in Innsbruck and have absolutely no idea where to start then just head to the center of town. Innsbruck’s Old Town boasts some incredible buildings, some even date back to the 1500’s. 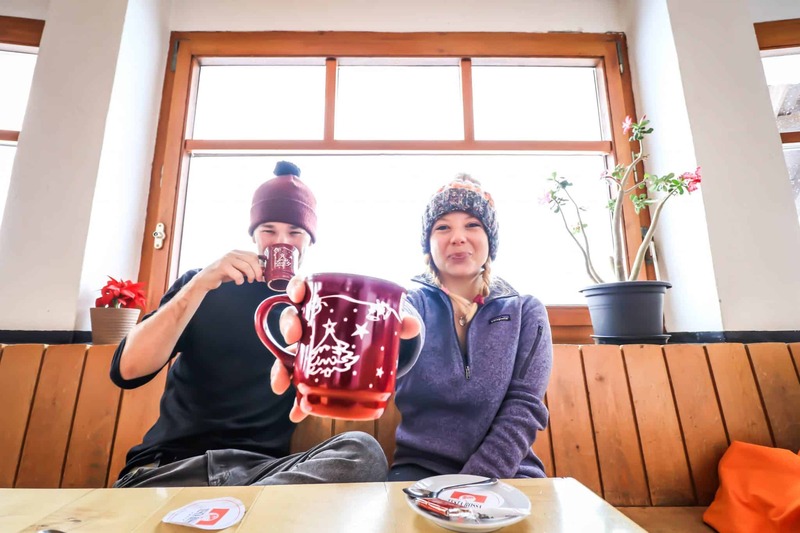 The Old Town is where you can take iconic photos of a colorful town beneath the Alps, grab a bite to eat, enjoy a cappuccino, gorge on apple strudels, shop, and just enjoy the atmosphere. The Old Town is buzzing almost any time of the year throughout the day. So, it’s a great place to find tourists, locals, and students from the University. Many of the other attractions mentioned in this post are located in the old town as well and you could easily allocate a day to the old town. The main reason we were dying to go to Innsbruck (besides the beauty, of course) was Olympia SkiWorld. Being the “Capital of the Alps there are a plethora of ski slopes. Olympia SkiWorld is a ski area that includes nine resorts within the Innsbruck area. They are easily accessible from Innsbruck and there is a free ski bus to shuttle you around. The ski resorts that are included are Kühtai, Nordkette-Seegrube, Patscherkofel, Axamer Lizum, Muttereralm, Rangger Köpfl, Glungezer, Schlick 2000, and the Stubai Glacier. We planned for three days in Innsbruck and only had time for a select few resorts. On our first day, we made our way up to Nordkette as the funicular is located right in the city center. Unfortunately, when we reached the top of Nordketter there were whiteout conditions, and our visibility was no beuno. But we did manage to enjoy playing in the snow, admiring the alpine trees, have a gluhwein, and dance inside the Cloud Nine Iglu Bar! There is something around Innsbruck for all levels and ability. Just because it’s the Alps doesn’t mean you have to be an expert skier. Prices are pretty reasonable to get the Olympia SkiWorld pass, which gives you lift tickets to all nine resorts, check here for more info. The mountains are always close to Innsbruck, and you can travel from the middle of Innsbruck to 1900 meters above sea level with the Nordkettenbahnen lifts in less than thirty minutes. Nordkette is the northern mountain range that stands above Innsbruck. The view from the top is simply astonishing and presents a number of hiking and photo opportunities. In the winter the mountain is best known for freeriding down some of the steepest routes in Europe. It’s truly a paradise for off-piste riding! Check out our ski and snowboarding packing list if you plan to ride! At the Olympic ice track in Igls adults and older children can experience the feeling of Olympic a bobsledder barrelling down the track. Don’t worry, you don’t have to have to train like an Olympian to get the feel for this activity. Two guests can be cradled between an experienced driver and brakeman while racing around 14 corners in under 60 seconds. You must book this activity in advance. One of the best free things to do in Innsbruck is to check out the Golden Roof. “Goldenes Dachl” in German is an iconic landmark in Innsbruck’s Alt Stadt. The gold roof dates back to 1500 when it was built for Emperor Maximilian I to mark his wedding to Bianca Maria Sforza. It is decorated with 2,657 fire-gilded copper tiles and is truly a sight to be seen. Although you can’t observe festivals and tournaments like the Emperor you can certainly admire the handicraft of this gorgeous roof from down below. There are many cross-country ski trails around Innsbruck to enjoy the surrounding nature. All you need is a pair of skis and you’re off into the beautiful Austrian countryside. Some notable places to take to the trails are at the Bilgeriloipe trail in Kuhtai, the Mieming Plateau, and near the village of Praxmar. A good alternative to skiing or snowboarding, especially for families with young children is tobogganing! You don’t need much to get started, just some warm clothes and a sled. It doesn’t cost much to spend a day or night on a sled and it’s a great way to enjoy the fresh winter air! We didn’t realize how exhilarating sledge riding was until we tried it in Trentino. Now we are completely hooked and try to do it at least once a winter. Innsbruck offers a number of toboggan runs, some at night. Maria Waldrast located at the base of Serles mountain and is one of the most popular places to go for a ride. The Karwendel – one of the largest natural landscapes in central Europe. After a year on safari in Africa, it’s safe to say we aren’t zoo people anymore. However, Innsbruck’s Alpenzoo is one of the highest in Europe and acts as a home to many Alpine animals. That means you can come here with the family to see bears, wolfs, moose, bison, and many birds of prey. It’s also the only zoo in the world where you can find the wallcreeper bird. Although the animals at the zoo may not be in the wild, the Alpenzoo is famous for reintroducing species back into their natural habitats, including the Alpine ibexes in Austria! The Swarovski Crystal World just outside of Innsbruck is extraordinary. A day trip here is a fun way to explore all things crystal. The Crystal World has the world’s largest Swarovski store and it’s sure to dazzle. Crystal isn’t the only attraction here, the Swarovski crystal world features an outdoor garden. “The Giant” is the thematic centerpiece of the whole area. It is said that the Giant set out to experience a world of wonders and settled in Wattens to watch over the gardens and his wonders. It’s a stunning piece of artwork, and impressive. If you’re looking for great views in the city of Innsbruck then the best place to head to is Adler’s Hotel. Adler’s Hotel is the tallest building in the city and provides astonishing views of the capital of the Alps (and of course, the Alps themselves). Floor 12 has a beautiful and modern bar that provides innovative cocktails or coffee for those looking to just relax while doing some work. Right next door is their restaurant which serves up delicious food to guests of the hotel and outsiders! We had a few cups of coffee here as well as a few meals and thoroughly enjoyed the hotel, bar, restaurant, and even outdoor terrace (although it was a bit chilly). We stayed at the Adler’s Hotel while in Innsbruck. Every room here has open views of the city and it’s literally right next to the train station. Could it get any better? We were surprised to find that Innsbruck has its own airport, and it’s literally right in the middle of the city. There are a number of direct flights from around Europe including Berlin, Amsterdam, London, and Stockholm. Innsbruck is the fifth largest city in Austria. Innsbruck is walkable; however, they do have an efficient bus network to get you around as well! 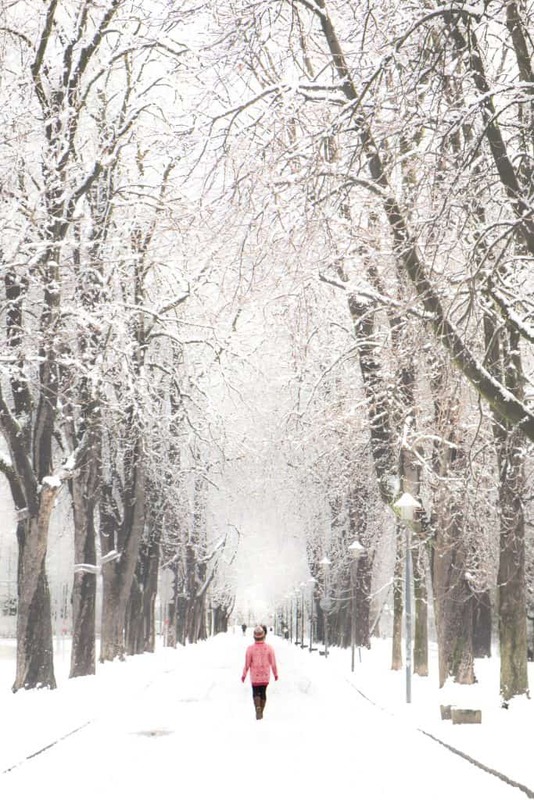 To make the most out of your trip to Innsbruck check out the Innsbruck Card. Check out our European packing list for your trip to Europe! Austria is within the Schengen Zone. Make sure to check your embassy’s website for visa restrictions. Austria uses the Euro note (€). ATM’s are easy to find around the city – check out our travel banking post for more. Remember that Austria uses the Europlug. Travel Insurance: We never travel without travel insurance, for short trips we recommend World Nomads. Natasha is a bit of a worry wart and would rather stay safe than sorry.